How much of my targeted raise amount will come from my “President’s List” and dealer syndicate? If you are confident in hitting the full raise amount, that is great news, but even then, think about your share distribution. When these shares come free trading, what type of pricing support will they see in the market? In addition to bringing in dollars and expanding your shareholder base, marketing your raise gives the extra bonus of greater overall market awareness and branding. Every investor in your private placement can become an active brand evangelist in social media, investor clubs, and online message boards. Ask yourself – is it time to expand our shareholder base? Sure, the retail investor can be reactionary, emotional, and irrational, but support in the retail market is usually the only bridge to get you from tightly held strategic shareholders to institutional interest. For early stage public companies, the retail investor is critical. Decide if there should be a retail component in your raise, and if so start building that marketing plan. Remember that attracting investor interest isn’t just about capturing their direct investment today – it is about adding their contact information to your database, and about getting them to start following your company, both online and on social media. Don’t forget – Financings are major milestones – do not miss the opportunity to leverage them as news, especially while the raise is “live”. The mandatory press releases announcing the opening and closing of your raise do not count as marketing! How do you find new direct investors? Look to your database first – this includes your email lists, your website traffic, and your social media. Second, itemize the different marketing, newsletter writers and industry coverage touchpoints that you already have. Get them your financing details, and encourage them to distribute the news. Don’t be shy – your company is moving forward, you are taking direct investment, and it needn’t be only Capital Markets insiders “in the know”. How will exemptions affect your marketing? While the “Accredited Investor” exemption is the most commonly used, the reality is that only 3% of Canadians qualify as Accredited. Even within our online community, which is purely investment based, only 16% self-identify as Accredited. How do you expand your reach? One option is to include the Investment Dealer exemption, which allows anyone deemed suitable by an IIROC Dealer to be qualified. If your marketing attracts investors who don’t already have a broker, this exemption can lead to new brokerage accounts, which can be a way to “pay back” your supporters on the broker side. Another intriguing option is the Offering Memorandum, which allows self-directed, non-Accredited investors to qualify. That means you can cast your marketing net even wider, as literally every investor that can afford the investment within the appropriate jurisdiction becomes your target audience. Crowdfunding exemptions are designed to allow for maximum marketing reach, but have very low individual investment limits. Crowdfunding exemptions are best suited for early stage, private company funding, not multi-million dollar public company raises. Based on CEO feedback, there is value to the crowdfunding exemption, but it is more about broader exposure than raising hard dollars. 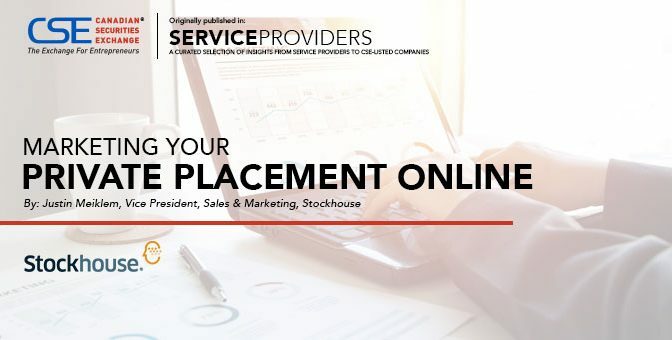 If you want to leverage both the traditional exemptions and the reach of the internet, consider an online deal portal that specializes in pubco private placements. Every financing is a valuable marketing opportunity to create news flow and to get on investors’ radars. Decide what your investor targets are, make a plan, and leverage every distribution outlet available to you.